The scientific payload of the Rosetta Orbiter includes the RPC [Rosetta Plasma Consortium], an integrated package of six instruments for measuring plasma particles, electric and magnetic fields and waves. 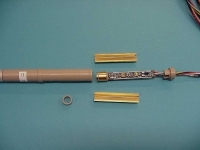 The Solar System Division (of ESA's Research and Scientific Support Department) collaborated in the development of two of these modules: the Mutual Impedance Probe (MIP) and the Langmuir Probe (LAP), with LPCE (France), the Swedish Institute of Space Physics and the Finnish Meterological Institute. The MIP and LAP sensors will analyse the plasma that populates the diamagnetic cavity in the close environment (10-100 km) of the cometary nucleus. This cavity contains a mixture of hot and cold electrons. The cold population (10-2 eV) is in thermal equilibrium with the atmosphere; the hot population (1 eV) consists of electrons freshly generated by the interaction of solar EUV photons with the neutral gas and the spacecraft's surface. 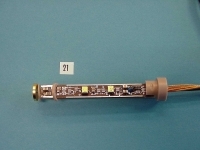 MIP is a quadrupolar probe that measures the frequency response of the coupling impedance between two dipoles. The plasma parameters are derived from the resonance peak and the interference pattern of thermal waves. LAP provides information about the plasma density and temperature from the current-voltage characteristics of two electrodes. The Division had full responsibility for the design, fabrication and testing of the MIP sensor with front end electronics. The sensor structure is made from lightweight carbon- fibre reinforced plastic. The four receiving and transmitting monopoles are made from aluminium. They are surface-treated with a special bead-blasting process to adjust thermal properties. The sensor is mounted close to the receiving antennas, on one of the orbiter's deployable booms, without any thermal control. As a consequence, the electronics has to work at a temperature range from -160 °C to +105 °C. A total of one breadboard, 2 engineering models, one qualification model and two flight models were manufactured, tested and delivered to the PI institute. The first measurements performed during the Rosetta commissioning in May 2004 show that the instrument is fully operational and in good health.